A week which has mostly passed me by with respect to the market. So what did happen? I've been following the a recent news story about John Darwin, who was a canoeist that faked his own death. He and his wife committed insurance fraud as he went into hiding in Panama. Darwin claims he had amnesia for the past five years. If he is found guilty he could face up to 10-years in prison. Darwin had been written off as dead by everyone, only to come to find that he wasn't dead after all, he was only on a short hiatus. John Darwin was alive, and so is this market. The bull market is not dead, nor is this a bear market. This bull market was only faking it's own death, perpetrating fraud against those who are short this market. Whom will ultimately pay the price for this deception. 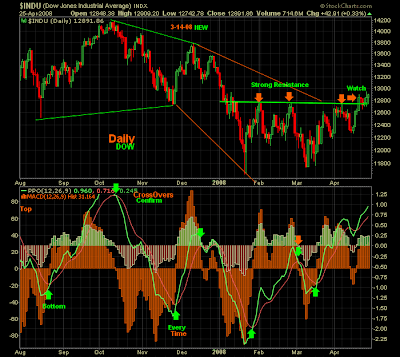 A week ago the DJIA broke out from overhead resistance. This week both the S&P 500 and the Nasdaq followed suit, with the Nasdaq closing above 2419 on Thursday and the S&P 500 closing above 1396 on Friday(see 1st chart below). The averages are all resting right below their intermediate declining trendlines, which they need to clear in order to change the trend. The Nasdaq erased losses by the end of the day on Friday, despite a disappointing earnings report from Microsoft. The averages all declined for the first part of the session as the University of Michigan consumer sentiment reading fell to 62.6, a 26 year low. However, the market once again shrugged off bad news and moved higher. You may recall that the market has been rising on bad news, like when that terrible jobs report came in, when the housing starts hit a 17 year low recently, and even when CPI headline inflation rose to 4.0 %. 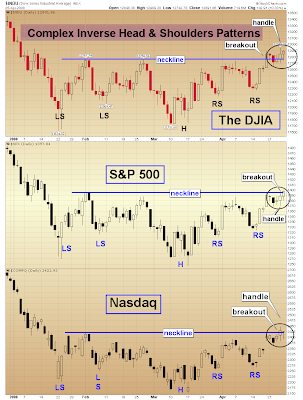 I have now re-classified all the major index daily charts as complex inverse head & shoulders patterns (1st chart below). I did so with the Dow and Nasdaq last week, and then the S&P 500 was re-classified this week. They still meet the double bottom criteria, but they possess certain technical attributes that are better suited for an inverse H & S pattern. I was previously perplexed in doing so based on the shallow first right shoulder on the averages, which appeared to be more part of the head than a individual shoulder. But the guidelines don't require each shoulder to touch the neckline and therefore it has been properly assessed. Now that the indices have broken out of overhead resistance, they are forming handles. I expect the handles to breakout by Monday or Tuesday. Handles form on many patterns, for instance a cup with a handle. On Friday, the average directional index (ADX) (14) crossed above the negative directional index (-DI) on the daily charts of the S&P 500 and the Dow. 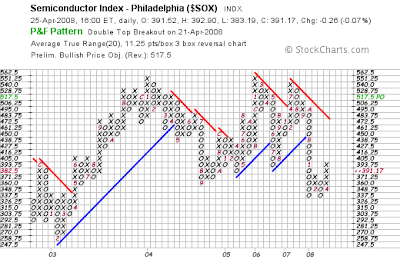 While the positive direction index remains above both the ADX and -DI lines. Additionally, the ADX has moved 4-steps off of its low on both averages. Signaling that a new trend to the upside is being born. The Aroon (2nd chart down)on the S&P 500, has also signaled that we are in a new up trend, as the Aroon up has a reading of 100. The Aroon oscillator is at the value of 100 as well. There will be a lot of important economic data next week. President Bush informed us that the rebate checks will be going out as early as next week, just prior to 1Q advance Gross Domestic Product (GDP) being announced on Wednesday. If the Fed holds steady or only cuts a quarter-point it would be good for the dollar and bring oil prices down from the stratosphere. A few days ago fed fund futures were at .50 %, but have since dropped to .38 %. I think if the Fed makes some positive comments regarding the economy, implying that it isn't necessary for them to take such an aggressive stance in cutting rates, it will send a positive signal to the market. 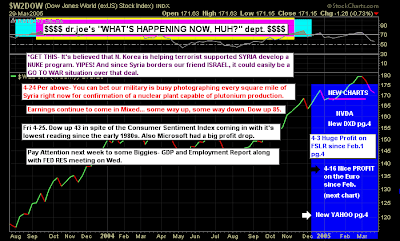 It would be interpeted as if it was the Fed's opinion, that the worst is behind us. Additionally, the effects of stimulus packages tend to work when they are used, and that should cause the 2nd and 3rd quarter GDP to significantly rise. The Democrats and Republicans are to be praised for their joint effort in passing the stimulus package, which will be targeted to 130 million middle class families with the propensity to consume. Thus, that should help corporate earnings and the retailers. 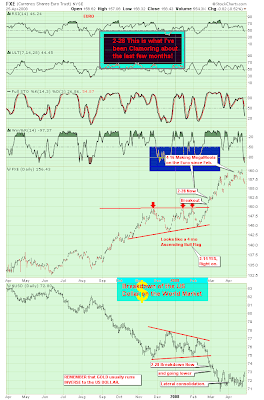 The dollar broke out of its downtrend this week and has likely put in a bottom (pg 2). The dollar has positive divergence on its daily chart, while crude oil has negative divergence. On Friday, oil prices (pg 2)spiked on news that the US fired on a Iranian vessel. The dollar is not collapsing or is it in a free fall, the dollar has put in a bottom and now should start to gradually rise. We continue to see a rotation out of commodities and into the financials. Which allowed the financials to break their intermediate downward trend one week ago, getting a follow-through this past week. The financial weekly chart continues to be extremely bullish. The indices weekly charts are extremely bullish at these levels, and we are poised for a rally that could last for the next 6 or 7 months. The Dow, the Transportation average, and the Nasdaq are backtesting their major trendlines on the weekly charts, (charts 5,6, & 7 below)that broke down in early January. The bears will tell us that this is a backtest, but they are wrong. Because a seismic shift has now taken place in favor of the bulls. 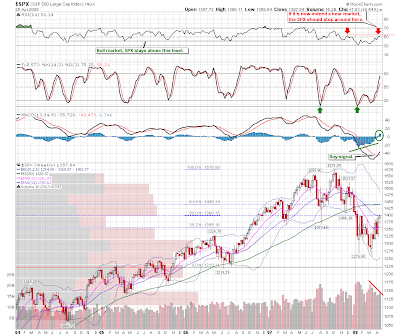 The market tide is turning as the 13-week EMAs have changed their slope, and are now on rise. Meanwhile the MACD histogram continues to have a rising slope. Market breadth is positive according to the advance/decline line (pg 2), the VIX (pg 2, the gage of fear) broke below it's 2007 rising trendline last week, and the S&P 500 bullish percentage is on the rise. Henry Ford of the Tradesniffer.com has some interesting measured move stock plays. 4/26 -- The short term charts are fairly strong, but the Dow has already hit its declining three-year trend line and is about to hit the one-year. Others will hit these declining lines soon as well. By the way...do you realize that the Dow has now retraced 50% of the entire decline from October? Everyone appears focused on SPX at 1400 (primarily because they think only in horizontal planes, but we know better!)... 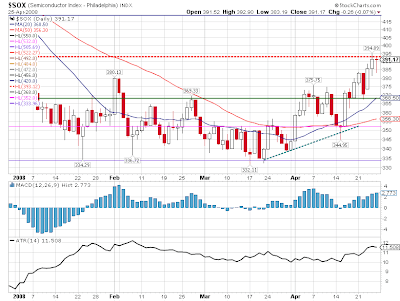 my chart says 1425 is really where upper resistance lies. Meanwhile, the golds and oils have lost their luster as people gravitate back into stocks, but I sense that will soon come to an end. I also see VIX bracing for another move back up (and the futures say so). 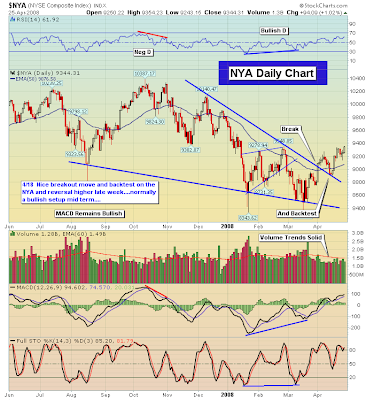 So, its up until things break for the major stock indexes, but that break may not be far away. 4/24 -- Gold and oils are now both faltering as the equities pick up strength. Techs and financials are strong. Money is clearly moving 'back in' to the things that were low and out of the ones that have risen sharply. Weak earnings are almost irrelevant. We're toppy in the short terms but still heading up. My biggest concern is the three year lines coming down as we're pretty much there on the Dow and others. That's one to watch closely. 4/23 -- The short term action of the last 4-5 days is now rather uncommitted. 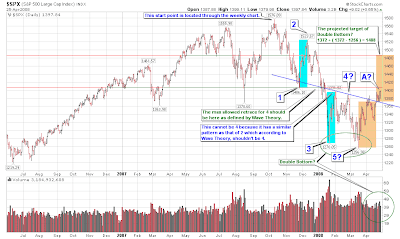 The Dow and SPX turned upward, breaking a small downward mini, but a larger picture is still unclear. It leans downward, though, while the small caps, led by strength in the techies leans more upward. Bear in mind that long term resistance lies ahead from declining upper lines on the one-year charts. 4/22 -- The breaks did lead us into small downchannels, but somehow they aren't looking that negative to me...at least not yet. This could turn out to be a very mild little short term decline and take off, but we'll know that soon enough if it breaks upper lines. Otherwise, its heading lower.